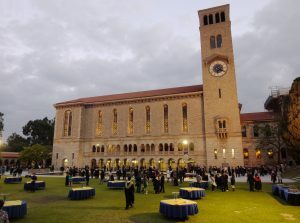 Like other MNU members, the University of Western Australia is involved in a wide range of activities relating to global citizenship; examples of some of these activities are provided below (though this is not an exhaustive list). The McCusker Centre seeks to foster caring, connected and socially engaged citizens who actively contribute to the wellbeing of their communities. The Centre offers structured, quality internships with not for profit, community and government organisations locally, regionally and globally. Both undergraduate and postgraduate students can complete an internship and earn academic credit towards their degree while doing so. The Centre also sponsors events and forums for students, academics, members of the public, not-for-profit, community organisations, government and business about making a difference in our community on contemporary social issues.